Ergonomic Kiosk for Easier Accessibility - Use a full-sized, vertically adjustable hardware keyboard, mouse, and 15-inch LCD touch screen with sliding platform. Support for Federal HSPD 12 Compliant Common Access Card Readers - eCopy ScanStation is the ideal solution for federal and Department of Defense agencies that must extend HSPD 12 compliance to multi-function copiers and scanners via Common Access Card (CAC) strong security measures. Scanning and Indexing with Rapid Data Entry - When you need manual indexing and classification of scanned documents, eCopy ScanStation lets you quickly enter index metadata values and visually confirm document previews to ensure all critical elements (such as a signature field, seal, or identifying marks) have been scanned completely. 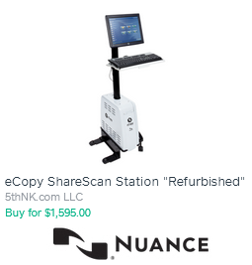 eCopy-Enablement for Non-eCopy-Ready Devices - Leveraging industry-standard ISIS and TWAIN scanning interfaces, eCopy ScanStation supports a wide range of copiers and scanning peripherals with eCopy ShareScan’s award-winning network scanning, OCR, and intuitive touch screen capabilities. eCopy ShareScan Suite included - eCopy ShareScan Suite also integrates with numerous Nuance and third-party connectors and extenders to expand and customize document-processing content. 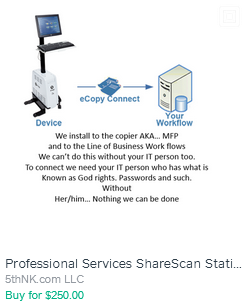 eCopy ShareScan is the most expandable MFP scanning and OCR platform. Additional Application Connectors & Document Processing Extenders are available for purchase.